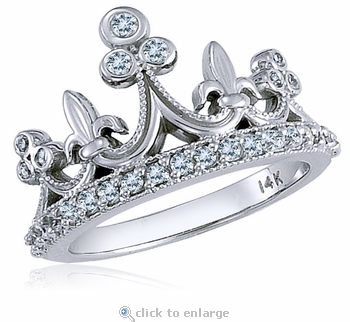 The Crown Princess Pave Cubic Zirconia Ring is a regal, yet whimsical addition to your fine jewelry collection. 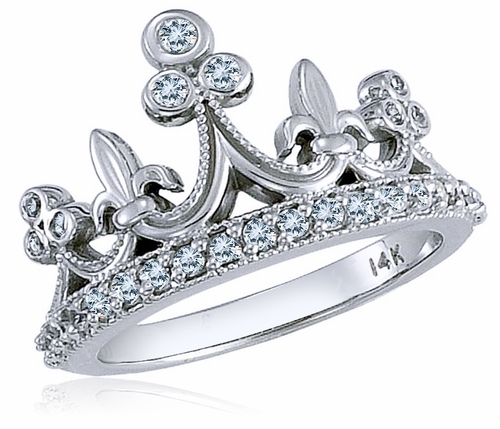 A beautifully detailed crown is adorned with an alternating fleur di lys and a triple bezel set round cluster of diamond look stones atop a band of pave set rounds cubic zirconia. Metal options in your choice of 14k yellow gold, 14k white gold, 18k yellow gold, 18k white gold and luxurious platinum are available. Whole and half finger sizes are available in the pull down menu and additional finger sizes can be ordered, please call for details. This ring includes approximately .40 carats of the finest hand cut and hand polished original Russian formula cubic zirconia expertly set to perfection. For further assistance, please contact us directly at 1-866-942-6663 or visit us via live chat and speak with a knowledgeable representative.